Just a week ago on the sidelines of 3rd Worldwide Cybersecurity Summit, Telecom and IT Minister of India, Kapil Sibal said the Indian Government will invest $200 million in coming 4 years, in order to strengthen their cyber security infrastructure. Now another move has been taken by Indian Govt where India and the United Kingdom have decided to enhance cooperation for reduction of the risk of threats from cyberspace to international security and strengthen bilateral cooperation to tackle cyber crime. At a joint press conference with External Affairs Minister Salman Khurshid, British Foreign Secretary William Hague supported India’s bid for membership in four export control regimes. 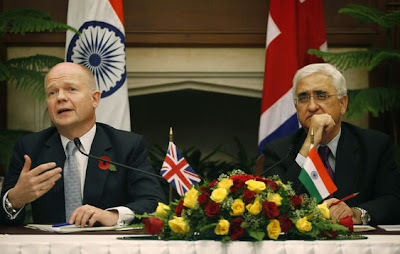 Britain, Mr. Hague said, also looked “forward to the time when India will have a permanent seat in the UN Security Council.” The two nations also finalized strategies on collaborating on building skills and capacities to tackle threats from cyberspace and to use ICT (information and communication technologies) for the objective of economic and social development. They also held discussions on using existing cooperation between universities and business communities to develop synergy in research and development on cyber issues. Besides the cyber issues, both sides discussed bilateral, regional and international issues of mutual interest. Henceforth, India and the UK would conduct their Cyber Dialogue on a bi-annual basis to achieve these objectives, said an official release issued by Indian External Affairs Ministry. While talking about India-Bratain cooperation in Cyber Security, we would also like to remind you that in 2011, a Cyber Shield deal Between India & US was made. Also in this year India and Israel have agreed to launch a long-term joint program worth USD 10 million annually to facilitate research on Cyber-Security.